Last week, we learned how to create a simple story using one 360 image. This week, the idea of a story expands into a virtual audio tour consisting of three or more images. 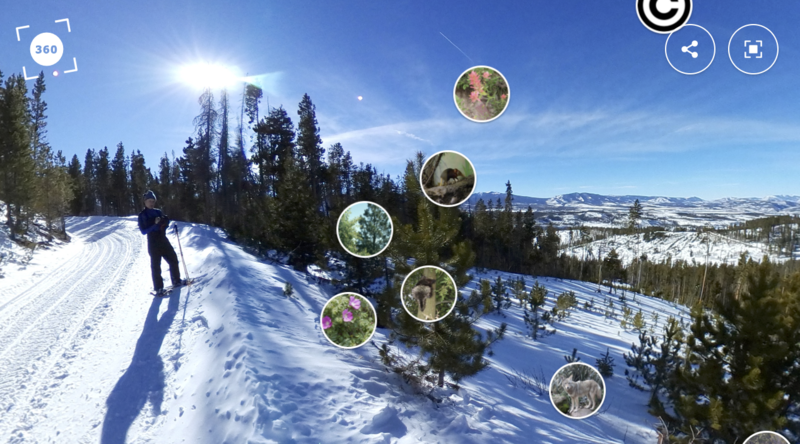 We are going to continue using the ThingLink 360 search and Clone function to find great base images, use a simple story planner to design a small audio tour anywhere in the world, and learn how to link images together using ThingLink’s tour functionality. We have chosen to feature two examples to illustrate design choices that feature audio. The first uses subtle background sounds to help explorers become immersed in the setting as if they were standing on the streets of each of the countries, combined with audio narration on tags. The other examples uses audio narration in the background to narrate the tour as an alternative to including narration on each of the tags. Explore this interactive example of a tour that takes learners across the globe to learn about Women's Rights across the globe, created by Founder and CEO of ThingLink, Ulla Engestrom. Our 360 image library includes capitals of the world to support tours that tell global stories. This example, created by ThingLink Certified Educator L. Michelle Salvant illustrates how to quickly create a tour on the go by using audio narration in the background. Many thanks to Nicole Dollins, Assistant Museum Director of the Museum of Military History in Kissimmee, FL, for agreeing to document the story of this exhibit right on the spot! 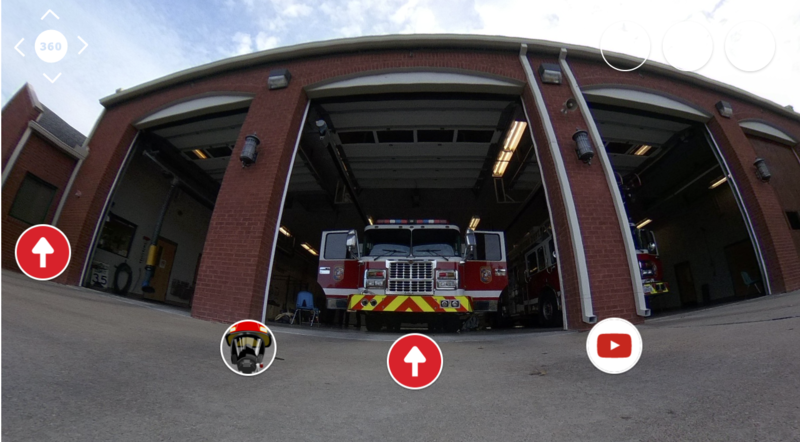 Explore these 360's in full-screen mode. Use the Task Card below for step-by-step interactive directions, powered by ThingLink. The most important part of the design process for immersive story building is in the planning. Use a story map or script to efficiently guide the work to save yourself a lot of time and energy. Every ThingLink starts with an image and to keep things simple and build on the learning each week, we will return to our 360 image library to find a set of at least 3 professional photos for this activity to create a tour. Browse through the images in the library and think about the type of story you want to tell. After you select your images, you will Clone them to make a copies for your own use. Our 360 image library includes capitals of the world to support tours that tell stories that take visitors across the globe. When choosing a theme for this activity, you will find all the 360s to travel the globe in our library.You can also use the search feature to find 360 images to clone and modify for use in this activity. Once you have a plan with a guiding document, you can create the tags to tell the story of each image. When all of your images are tagged, you will learn to create a tag that brings you from one image to the next to create a tour. To help everyone learn how to design for a VR viewing experience we restricted the types of tags in the first activity This helps us create a nice collection of activities for our community to use with students, and it also helps everyone understand the difference between creating an image for viewing in a VR headset and creating and image for use on the other types of devies available in schools. We hope the handy chart we made will help you. All other activities can be designed any type of device, which means you can use YouTube and other types of tags to create. The play button is only an obstacle when viewing in a VR headset. If you do design this lesson for VR, please add a tag with the hashtag #VR so users can search for it. Try it on a laptop, tablet or phone. ThingLink 360 works on the devices you have handy at the moment. 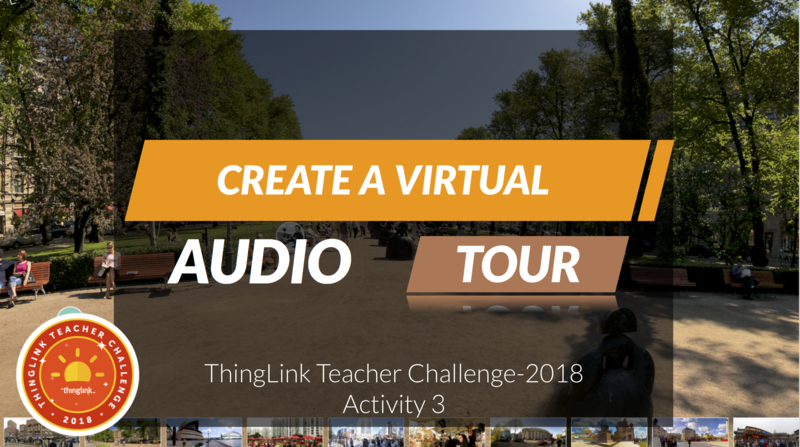 Follow the steps to Design Your Immersive Audio Tour with ThingLink. Be sure to click on the tags to access video tutorials and resources. We invite you to connect and collaborate with educators participating in this PD via this Padlet. It's best when viewed in full screen so please click the link to join in.